TINFOILHAT: Am I Asking the Wrong Questions? What did politicians know about that scandal? Will the stock market rally another year? What happened to penny candy? How much longer can “they” hold it together? Will gold prices ever get to $2,000? In my opinion these are often the wrong questions. Ask better questions and we receive more relevant answers. I find this funny because HRC won’t answer questions, BHO just flat out lies (i.e., keep your doctor), and politicians just stall until you give up. Sharyl Attkisson just gave written testimony how the Gooferment evades and stonewalls FOI requests. And, everything Gooferment plans to do is either classified, secret, or redacted. So, when the author cites Groucho, I understand. It’s related to: “I wouldn’t believe you, if your tongue came notarized.” … attributed to Judge Marilyn Milian, but may have an earlier history. I see an county that is going quickly in the wrong direction, but have no idea how to stop it. As the FED turns up the heat in the central bank frying pan, the frogs (public) don’t realize they are being cooked to death by inflation. I am quite amazed how loud the sizzling sound has become, but for some odd reason hardly anyone notices it. Unfortunately, we are well past the point of no return. It’s only a matter of time now before the whole “Financial Cliff” falls off the mountain side. Until then, gold and silver investors will have to put up with some of the worst analysis ever to come out of government and MSM. Another indication that “someone” is cooking the books. In a free market, commodities don’t diverge from glacial trends. Of course, as a tin foil hat, I suspect manipulation. The FED can print “dollars”, but they can’t print gold, silver, oil, land, food, water, bandaids, or bullets. This is all a fraud being pulled on the Sheeple and Clovers. GOLDBUG: Waiting lists for coins and bars? Gold buyers are having to wait up to six weeks for their bars and coins after a price dip led to increased interest. Investment company Physical Gold said there were waiting lists of three weeks for some coins, and four to six weeks for gold bars. “Previously all would have been available within a few days,” the company said. The company said that it had seen a 50pc increase in enquiries about purchasing gold and a 35pc increase in sales, with people buying tax-free gold coins. “We are now starting to experience physical gold shortages,” said Daniel Fisher, CEO of Physical Gold. 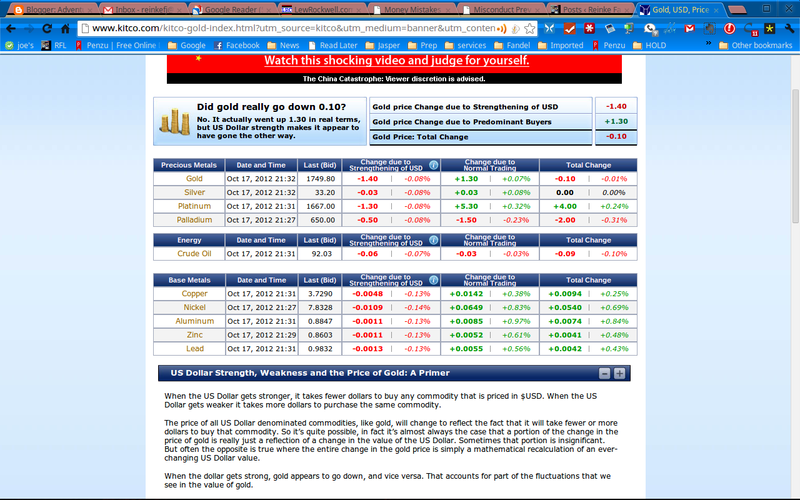 Yeah, the price drops on “paper” gold, but premiums (seniorage) on “hard” gold goes up. Now who doesn’t think the Sheeple and Clovers aren’t being manipulated? MONEY: PT is less than AU? Take a look at the price of platinum versus gold. Price manipulation in the commodities markets in advance of the election? Wonder when we’ll hear about the derivative contracts that are used to move the market.